South Wales based Drew has been making waves all over the UK comedy scene despite only being active since April 2015. A sharp observational style combined with a strong stage presence and confidence has meant Drew has fitted right in alongside some of the far more experienced acts he has been booked to support. In addition to this, Drew also regularly MCs three different nights across the South Wales scene. Drew is currently best suited to opener and paid middle spots for any sized night and can also close and MC small rooms with ease. 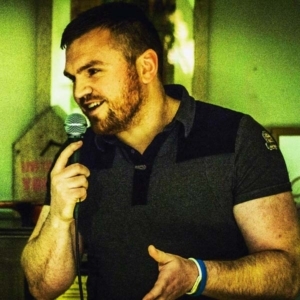 Alongside Steffan Evans, Drew performed his debut hour show, “Tales from Wales” at the Cardiff Comedy Festival 2016 and is touring this show across Wales and the South of England during the autumn, winter and spring of 2016/17. ‘Drew is one of our favourite acts who has played at the club.. His sharp observations and great punch lines meant he was instantly loved by our punters and he filled the middle spot of an already strong night with ease. A very likeable act, Drew is far beyond his comedy years. Highly recommend booking him.’ – Freshly Squeezed Comedy.